Several steel products from BlueScope Lysaght were used in the modernisation program of the warehousing facilities of the Australian Defence Force (ADF). ADF’s Defence Logistics Transformation Program or DLTP is designed to ‘modernise and enhance Defence's warehousing and distribution functions to provide optimum support to Defence operations’. As one pivotal part of the ADF’s Strategic Reform Program, the DLTP is purpose-built to improve the efficiency and effectiveness of Australia’s defence capability. With the project requiring construction of both warehousing and testing facilities, getting this strategically-vital infrastructure to the state of combat readiness was a small battle in itself. 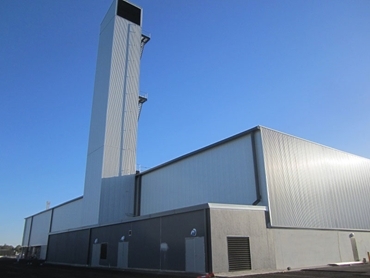 According to Marvin Hicks, Sales Area Manager - Commercial Market, Lysaght, manufacturing the required 460 tonnes of steel to completion and to specification was just the start of the challenge. The large tonnage and long lengths of the KLIP-LOK 700 roofing needed to be manufactured and loaded directly onto the truck and delivered at the site the next morning. The efficiency of Lysaght’s supply chain had a very positive effect downstream with the roofing contractor, Axis Building Group confirming Lysaght’s smart approach to service and supply. Cameron Tabone, Axis Building Group Project Co-ordinator commented that the sheer scale and time constraints of this job meant that they could not afford any delays whatsoever; the availability of the product on time, every time therefore was a huge advantage. In terms of actual coverage, the roofing contractor laid 81,000 square metres of KLIP-LOK 700 roofing plus some 19,000 square metres of 0.48mm SPANDEK ZINCALUME . According to Lysaght, the SupaZed 200 purlins tipped the scales at just over 270 tonnes equivalent to about 60,000 lineal metres in all. The magnitude of the project meant that 50-60 workers needed to be managed and co-ordinated for the first three months, six days per week. Cameron credits Lysaght for the clockwork precision. Lysaght’s Marvin Hicks said this commitment to manufacturing and delivery excellence was something they factored into the job well before it started. For instance, Lysaght ensured their customer service reps managed the project from order take to order delivery, which they do on all major projects. The LOK-KLIP end and expansion joint solution was being used in a major project for the first time; with Lysaght supplying approximately 560 lineal meters of the lapping system. The low profile of the LOK-KLIP system maintained the long clean lines of the roofing, without cluttering it with clearly visible step joints. Due to the sheer scale of this project, Lysaght made sure they had enough coil in stock to fulfil the customer’s requirements. In practical terms, this meant ensuring the stock was always ready for Axis to use - communicating with Lysaght stock control and updating them with the ongoing project progression was just one factor in this process. Marvin added that they made sure to schedule their transport using an extendable trailer so that it was available for the customer’s deliveries. The trucks were offloaded in a reasonable timeframe so they were able to return to Lysaght the same day for loading and delivering to other customers’ orders the next day. For his part, Cameron said one of his biggest on-site challenges was the building of the 30m high parachute-training tower, which had to be completed in three sections on the ground, and then put together ‘a bit like a Lego structure’. Also constructed from 0.48mm SPANDEK ZINCALUME, the parachute tower work went off smoothly and without a hitch, thanks to the open communication and smart delivery scheduling by Lysaght.